A small post to present the complete JQuery.ajax syntax (http://api.jquery.com/jQuery.ajax/). I’ve also added a simple timer. 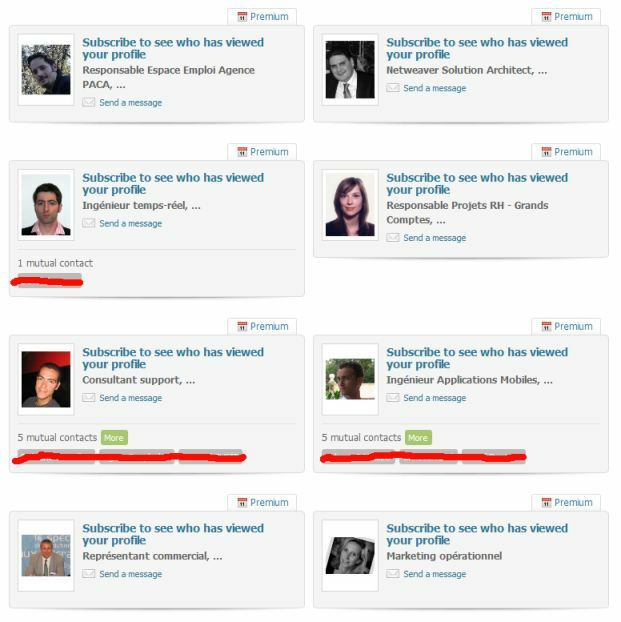 Viadeo has a feature to reveal who visited your profile…. but you first have to pay to become a premium user. But the way viadeo presents us the different profiles « anonymized » (cf picture1) contains a token which identify a profile. To illustrate this tiny breach in their business, I’ve created a small script you can launch when browsing the viadeo « profile visits view ». Basically it replaces all links on profile cards by the user profile link whereas normally they point to the subscription page. The script also browses for you the different profiles and replace the labels by the real name and job position from your visitor (cf picture 2). Be careful that this latest option creates automated activity for your account and indicates to the profiles being revealed that you have visited them.